The 2009 Black Saturday fires burned 437,000 hectares of Victoria, including tens of thousands of hectares of Mountain Ash forest. As we approach the tenth anniversary of these fires, we are reminded of their legacy by the thousands of tall Mountain ash "skeletons" still standing across the landscape. Most of them are scattered amid a mosaic of regenerating forest, including areas regrowing after logging. But while we can track the obvious visible destruction of fire and logging, we know very little about what's happening beneath the ground. In a new study published in Nature Geoscience, we investigated how forest soils were impacted by fire and logging. To our surprise, we found it can take up to 80 years for soils to recover. Soils have crucial roles in forests. They are the basis for almost all terrestrial life and influence plant growth and survival, communities of beneficial fungi and bacteria, and cycles of key nutrients (including storing massive amounts of carbon). To test the influence of severe and intensive disturbances like fire and logging, we compared key soil measures (such as the nutrients that plants need for growth) in forests with different histories. This included old forests that have been undisturbed since the 1850s, forests burned by major fires in 1939, 1983 and 2009, forests that were clearfell-logged in the 1980s or 2009-10, or salvage-logged in 2009-10 after being burned in the Black Saturday fires. We found major impacts on forest soils, with pronounced reductions of key soil nutrients like available phosphorus and nitrate. 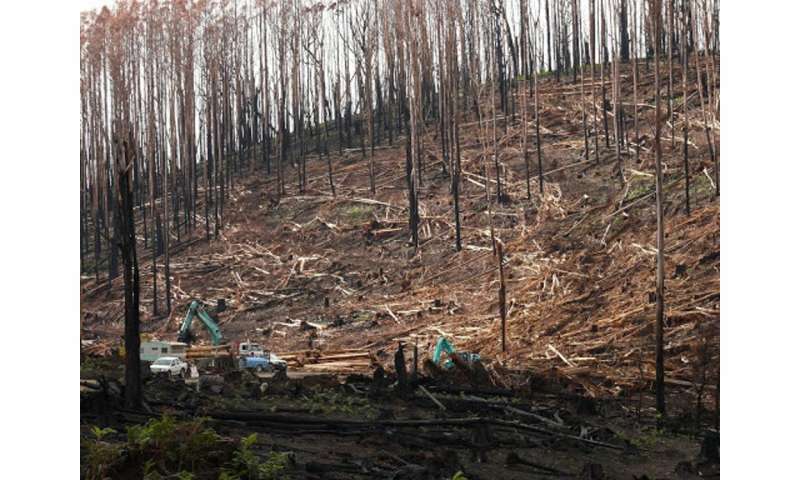 A shock finding was how long these impacts lasted: at least 80 years after fire, and at least 30 years after clearfell logging (which removes all vegetation in an area using heavy machinery). However, the effects of disturbance on soils may persist for much longer than 80 years. During a fire, soil temperatures can exceed 500℃, which can result in soil nutrient loss and long-lasting structural changes to the soil. We found the frequency of fires was also a key factor. For instance, forests that have burned twice since 1850 had significantly lower measures of organic carbon, available phosphorus, sulfur and nitrate, relative to forests that had been burned once. Sites subject to clearfell logging also had significantly lower levels of organic carbon, nitrate and available phosphorus, relative to unlogged areas. Clearfell logging involves removing all commercially valuable trees from a site – most of which are used to make paper. 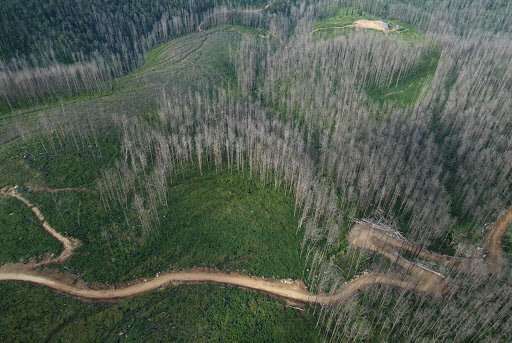 The debris remaining after logging (tree heads, lateral branches, understorey trees) is then burned and the cut site is aerially sewn with Mountain Ash seed to start the process of regeneration. 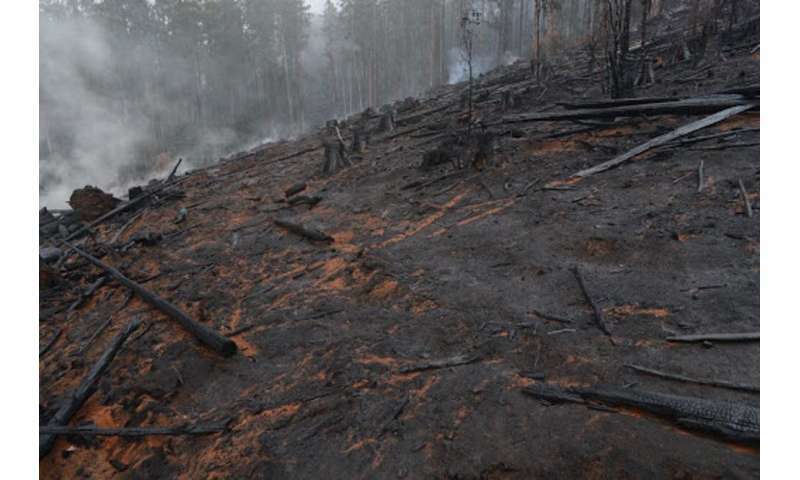 The impacts of logging on forest soils differs from that of fire because of the high-intensity combination of clearing the forest with machinery and post-logging "slash" burning of debris left on the ground. This can expose the forest floor, compact the soil, deplete soil nutrients, and release large amounts of carbon dioxide into the atmosphere. Predicted future increases in the number, frequency, intensity and extent of fires in Mountain Ash forests, coupled with ongoing logging, will likely result in further declines in soil nutrients in the long term. These kinds of effects on soils matter in Mountain Ash forests because 98.8% of the forest have already been burned or logged and are 80 years old or younger. To maintain the vital roles that soils play in ecosystems, such as carbon storage and supporting plant growth, land managers must consider the repercussions of current and future disturbances on forest soils when planning how to use or protect land. Indeed, a critical part of long-term sustainable forest management must be to create more undisturbed areas, to conserve soil conditions. Specifically, clearfell logging should be limited wherever possible, especially in areas that have been subject to previous fire and logging. Ecologically vital, large old trees in Mountain Ash forests may take over a century to recover from fire or logging. Our new findings indicate that forest soils may take a similar amount of time to recover.